TICKETS: start at $15, plus applicable service fees, and are on sale now at Brown Paper Tickets. 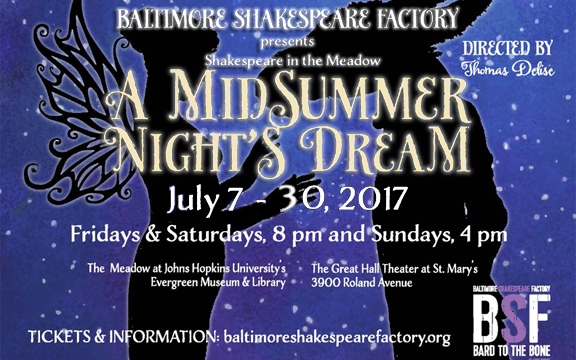 For more information, call (410) 662-9455 or visit BaltimoreShakespeareFactory.org. As with all BSF productions, A Midsummer Night’s Dream and Love’s Labour’s Lost are presented using the staging conditions of Shakespeare's day. The productions bring Shakespeare's works to life in a way that is fresh and accessible to modern audiences without compromising the original language. The result is fun, engaging, and fast-paced shows that celebrates the artistry of Shakespeare's language. A Midsummer Night’s Dream, directed by BSF Artistic Director Tom Delise, is a magical tale of young lovers, supernatural creatures, and a charming group of artisan performers that is one of Shakespeare’s most popular and endearing works. It is two hours of perfect theatre that has charmed audiences for over 400 years. Love’s Labour’s Lost, directed by BSF Assistant Artistic Director Chris Cotterman, is a tale of what happens when friends take an oath to hid away and dedicate themselves to a life of study and avoid the company of women for three years. As soon as the pledge is made, beautiful women arrive and begin to test the men’s high-minded resolve. “Love's Labour's Lost is dazzlingly creative and confident; absurd in all the best ways, it's also remarkably fresh, gleefully skewering gender norms and the conventions of courtship with the dizzy delight that's the hallmark of Shakespeare's best work,” says Cotterman.